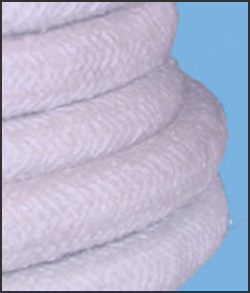 Ceramic Fiber Rope : Ceramic Rope, Ceramic Rope Manufacturers, Ceramic Rope Manufacturers in India, Graphite Lubricated Ceramic Fiber Rope, PTFE Teflon Gland Packing. Ceramic Rope is a compression packing for very high temperature duties. It is manufactured from an exceptionally stable fibre material that is soft, non-irritating, non-hazardous & is not limited by World Health Organisation or European Union restrictions. Other examples include door seals for annealing furnaces at steelworks, kiln packings, protective surfaces on pottery kiln cars, and stem gland sealing on valves handling very high temperature gases.